Not sure i understand what the problem has been…? It stopped working on 14500? What flash do you refer to? Sorry this is a bit confusing. Well from the beginning, because my french is not good enough. OK, thanks! Something went wrong obviously… and cooked the led? This sounds like the typical AA driver that cannot withstand Li-ion. I think someone already mentioned having an issue after using a 14500…? It started flickering and just turned off. Now even with AA eneloops it flickers like mad and turns off. @SKV89: any news about this issue and Enogear CS? Received mine from Hong Kong after 6 weeks, not bad. It came inside a thin ziplock inside an envelope. Tried to open it. Well, good luck. The body-plus-switch is screwed on to one side of the pill, and the head is screwed on to the other side of the pill. So when you open the light it is going to be a kind of a lottery to which part the pill will stick: to the head or to the body. There’s a noticeable gap between head and the body. There's a noticeable gap between head and the body. Oh, so maybe you have a AA-only light. And not 14500 compatible!?!?!? I finally received this light after almost two month waiting. Packed inside a thin zip pouch wrapped with some film, all inside a simple bubble envelop. A terrible petroleum smell was all over it and the packaging felt a bit sticky. Even after washing my hands twice i could still smell it! There is a small gap between the head and the body. Not that much really… but you can see the brass from the pill. Nice and compact SS light. I tried it on a regular AA cell. Not bad. There is a marking on the driver that i remember having seen elsewhere: AIRAYLAND. Is it really 14500 capable? Been running a 14500 in mine since I got it. Over a month ago I think. I use it daily. Never even a hiccup out of it. You’re right though. The packaging was kind of, well, different. Mine as well has a small gap between head and body. Must just be the design of it. Never tried an alky or nimh in mine so not real sure on the difference in output. I’ll charge up a eneloop and take a gander at it. I love the thing. Was thinking of getting a few more. If mine ever comes, I’m afraid of using 14500 now after hearing about the failures. Even if CS is good, it will take 2 months to get parts or replacement. It arrived yesterday, 8 weeks to the day. The package was a simple mailing envelope with the light in a baggie wrapped in tape . It smelled like some kind of penetrating oil . The light is very nice . Attractive styling . Rosie tint. Compact but heavy. I emailed Jacky to ask if 14500 was compatible . He got right back and said it was but cautioned it has no stepdown so it will get hot. Tried AA first . OK simple UI with L,M,H . Low is not ML which for me is better. Next tried 14500 and everything went well so far. Only put it on high for short while. Overall I give this light a thumbs up . Would make a nice gift light . I will EDC it for a while and see how it lasts. Not sure if it is easy to get into for modding. Hopefully someone more experienced in that will give us a report. Hmmm. I don’t think the reason it dies on 14500 is due to heat from no stepdown. I only put 14500 in to do a ceiling bounce test and it died literally within a few seconds. While it worked, it was much brighter on 14500 than AA though so it would be a great EDC with 14500 if it works reliably. I posted my results here so you can compare it with other AA lights too. I haven’t tried with 14500 yet. 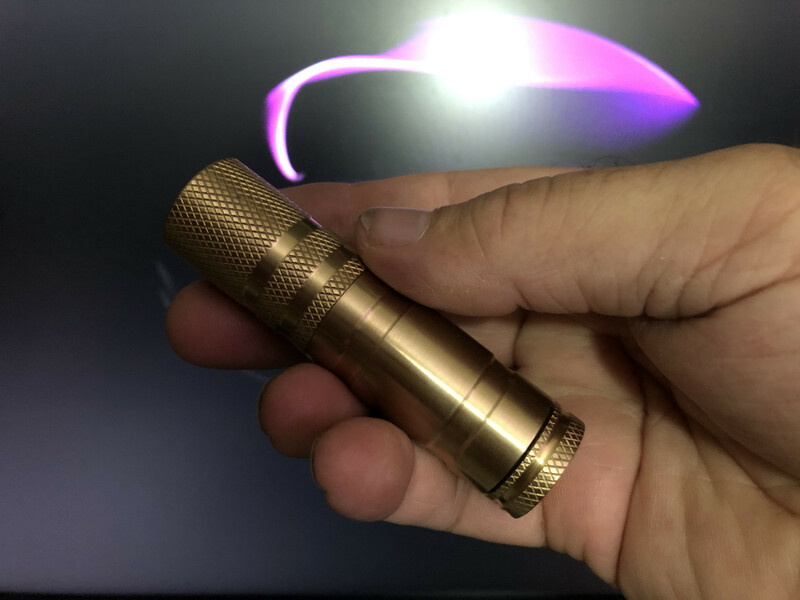 Got my little 18500 Brass Beauty in the mail today, 3 weeks to my door from Enogear. Not too bad. Promptly pulled the XM-L2 and 7135 chip driver and put an FET+1 Bistro driver with an XP-L V3 3A HI emitter… on an Efest 18500 1000mAh cell it does 1211 lumens in Turbo. Nice! I have the Ti 18650 headed this way. Was thinking of that brass one next. Just wish I had the hands and eyes to do a successful mod on it. These are made as compact as possible, everything about them has very low tolerance so it’s a pretty tight situation to be modifiying. 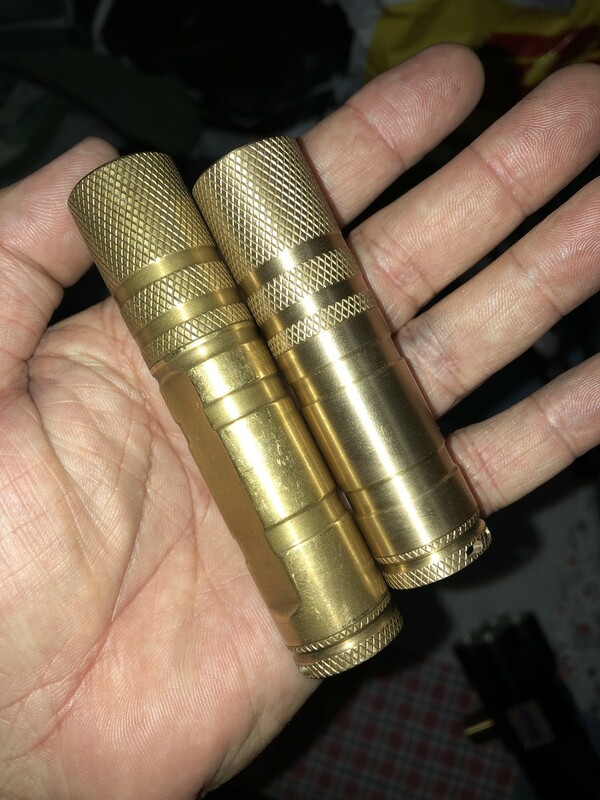 My wife’s 18650 DQG Brass Beauty only takes one cell in all the cells I have, and that’s a lap pull. Tight, as compact as they could possibly make it. So…how hard would be to mod it Dale? Mind posting any thing on its “entrails”, please? It has a brass pill threaded into the head much like a Convoy S2 (the old style, without the integrated emitter shelf), simple enough to bump the existing driver with a couple of 7135 chips or swap it out with an FET+1 style driver like the X6 Bistro. (which is what I did) I also swapped in an XP-L V3 3A HI on a Noctigon. Basic stuff, not all that difficult to do. Edit: FWIW, I didn’t put a spring on the Bistro driver but instead built up the pad with solder just enough for the cell to make contact without the retaining ring impeding it. This allows the 18500 to fit inside, don’t think a button top cell would allow the tail cap to go on fully. Would probably still work as everything here is brass so ground is good with first contact of the threads. There is a white plastic insulation disc in the tail cap to isolate the switch and there is a white plastic centering ring for the aluminum reflector, other than the glass lens and the o-rings everything else is brass. Everything! Even the button to turn the light on/off. My wife has had a DQG Brass Beauty in her purse for years, this one is EXACTLY the same except the battery tube is shorter and doesn’t have flats cut on it’s side. The heads match up perfectly as do the tail caps. Also, if I perceived well the pill doesn’t have a shelf? I thought the S2 pills were like the S2+ only being shorter. 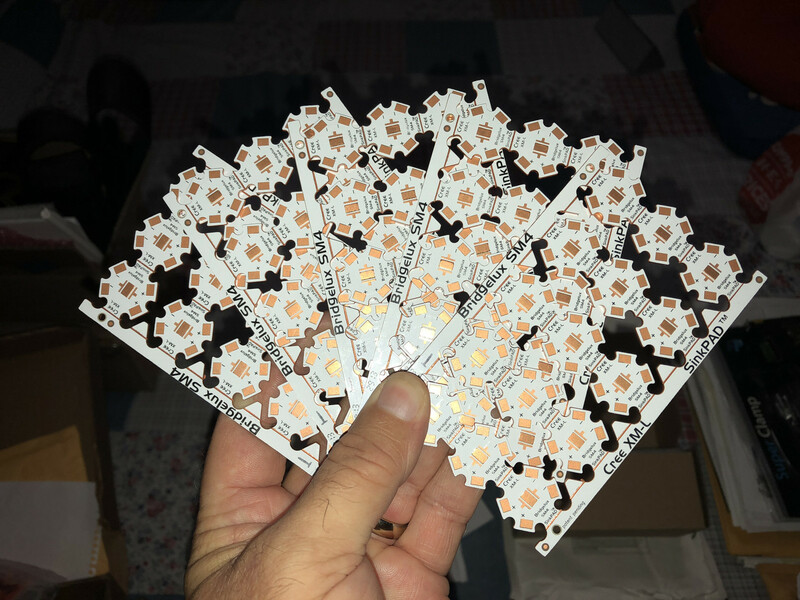 In any case DTP MCPCB (noctigon or not) are recommended to allow the led to light up according to the driver’s power! This DQG has a threaded in pill, I guess the S2+ also has a pill as I got a copper one from Hoop for this light, so yeah, it’s kinda like that. Or a Sinner EDC. And, Read em and weep Boys, read em and weep! I was on friendly terms with the Lady at SinkPAD when they switched over from their original to the SinkPADII version, I bought 200 of the old ones, the last they had in stock. I could be wrong but I suspect these are not brass but instead, bronze. See how the old one hasn’t blackened with age? No special care, it sits in my wife’s purse and get’s used whenever she needs a light. She’s also got a tiny little Olight Titanium in her purse as well as a blue Emisar D4. A Luxeon V (4000K) can also be a good choice for the emitter. How are the threads on the brass 18500? I once had the AA brass version and the threads were really tiny. I have 0.5mm threads and just got through cutting some 0.75mm that are pretty fine, tiny works, lol. 2 months from ordering, still no light. I won’t order there again. they are slow but it will arrive. Very nice light for the money. Bought it as a host, but the tint and output are very acceptable. Gonna leave it as is for now and use it as a general around the house / family light on nihm. At least till my sw40 r9080 nichia’s arrive. Just returning to say that after a few days of edcing this light I like it even more. Maybe because I wasn’t expecting much, but it performs well above its price. - Tint is great, I probably wont even change the emiter. It has become my “ dress EDC “ . It has some style. Just got mine. I am very impressed, for what I paid it is a bargain. Love the tint. Just trying to get up the courage to stick a 14500 in it. Do I risk it? I did not risk it. It has decent output on nihm and I had no non-lion lights left so I am fine with an AA in this one. Go for it. Mine so far has been ok with 14500. It is a really cool little light , right?